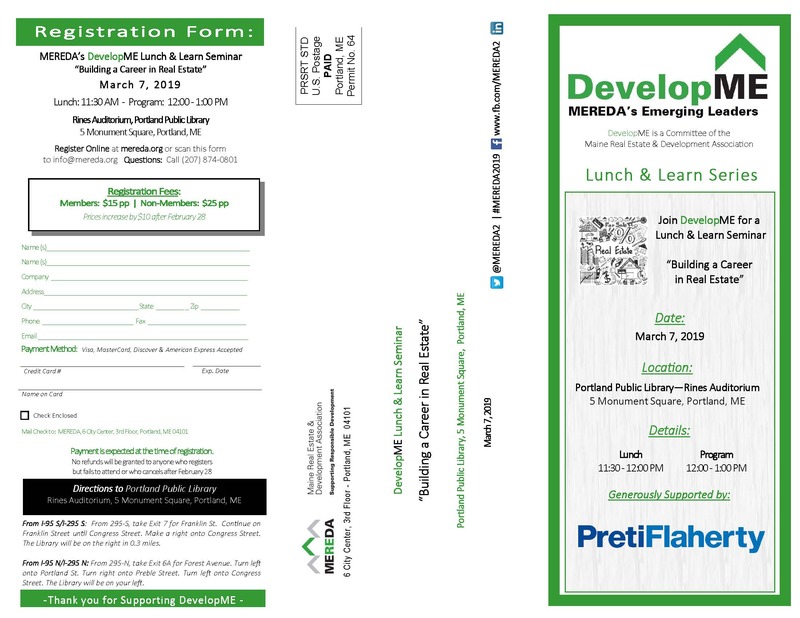 Join DevelopME on Thursday March 7, 2019 at the Portland Public Library from 11:30 a.m.—1:00 p.m. for their latest Lunch and Learn event, “Building a Career In Real Estate” to hear three industry veterans answer questions about how they navigated their careers in the pine tree state. Josh Fifield of Clark Insurance will moderate the discussion and we will hear from Kim Twitchell, Maine Regional President at NBT Bank along with Roxane Cole, Managing Member/Commercial Broker at Roxane Cole Commercial Real Estate, and Erin Cooperrider, Partner at the New Height Group and Development Strategist at Community Housing of Maine. Josh Fifield is currently a Senior Account Executive at Clark Insurance, a 100% Employee Owned Company headquartered in Portland ME, where he partners with businesses to offer customized commercial insurance solutions. Josh draws from over 15-years of experience in the insurance industry, having worked on both the agency side and carrier side as an underwriter at MEMIC. As a community leader, Josh serves as a director on the Maine Real Estate Development Association (MEREDA) Board and co-chairs MEREDA’s Marketing & Membership committee. He is also a board member for Portland Little League and Vice Chair for Town & Country Federal Credit Union. Roxane Cole is an entrepreneur. After graduating from the University of Maine at Orono she taught school briefly but found her strong interest was entrepreneurial ventures. At age twenty-five she founded and co-owned a chain of retail stores and a mail order business which she sold before entering the field of commercial real estate. In February 2010, after decades as a commercial broker, she founded the firm Roxane Cole Commercial Real Estate. With her 30 years of experience as a commercial broker, Roxane has made an indelible impact on Maine’s real estate industry and MEREDA. Roxane has been an active member of MEREDA’s Board of Directors since 2003, having served as president from 2006-2008 and recently received MEREDA’s 2018 President’s Award. Erin Cooperrider is a partner at NewHeight Group, a Portland-based development firm and Development Strategist for Community Housing of Maine, a 25-year old non-profit affordable housing developer also based in Portland. In her work with NewHeight Group, Erin manages permitting, financing, and the construction process. During her tenure at CHOM, Erin helped to grow the organization’s asset base from $7 to more than $60 million. Before joining CHOM in 2002, Erin worked in commercial real estate development in Maine, and asset management and real estate development consulting outside of Maine. Erin was a co-founder of The Signal Group, a 23-year old real estate services company based in Portland, Maine. She serves on the Advisory Council of the Federal Home Loan Bank of Boston. Erin received her undergraduate degree from Duke University and her graduate degree from Stanford University. Kim Twitchell, Maine Regional President at NBT Bank has approximately 30 years of experience in commercial banking in Maine, with the last 20 focused primarily in commercial real estate. Kim started her career as a commercial analyst with Fleet National Bank in 1989 and spent 17 years with Fleet/Bank of America before joining TD Bank in 2006 as a senior lender and commercial real estate manager. Kim joined NBT Bank in November 2014 as their Regional Commercial Banking Manager and is currently the Regional President for NBT’s Portland, Maine operation and is board member of MEREDA, Avesta Housing Development Corporation and Community Housing of Maine. Your RSVP is requested by February 28, 2019. Payment is expected at the time of registration. No refunds will be granted to anyone who registers, but fails to attend or who cancels after February 28, 2019.